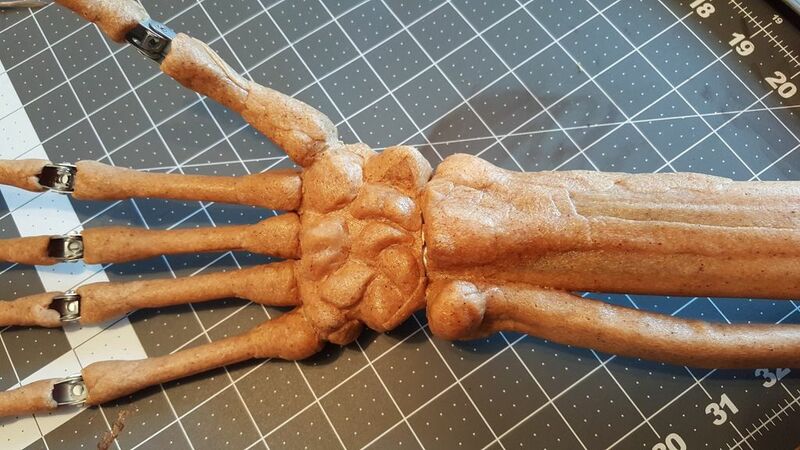 Gary Petit created an amazing, articulated skeleton hand with Worbla, and shared his highly detailed tutorial with us! Be sure to check out the video to see how well this moves! Back in 2014 I created the Ultimate Grim Reaper Project. One of the hardest parts of that costume was creating hands that look like bones but can also stand up to a lot of use. I had to settle for small plastic tubes and coat hanger wire wrapped with latex so I could, at least pose the fingers. The challenge of making an articulated hand is finding the right material to make the joints and the ability to incorporate some sort of spring tension into the fingers so they remain in the open position until you pull them closed. Anyone who has attempted this can appreciate how complex this can be. I always wanted to create a skeleton hand that I could articulate but gave up after several failed attempts. Until, I was working on another small project and was shopping at my favorite Halloween supply store, Home Depot. 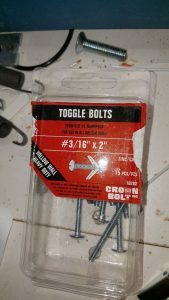 While picking up a couple bolts, my eye was drawn to a box of Toggle Bolts. 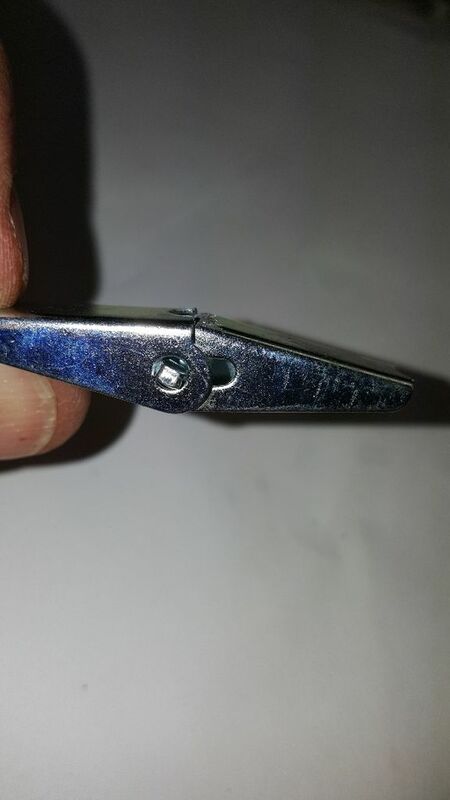 There it was, a metal joint with a built in spring. Not perfect but I can make this work. 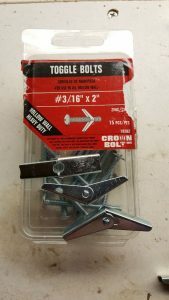 Conveniently, the box had 15 pieces and I needed 14 for each hand. Grabbed a third box for good measure. 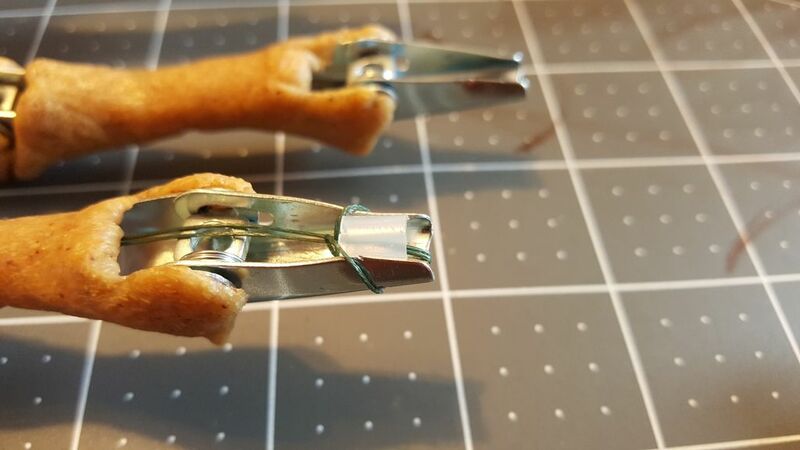 Now that I found the joints for the fingers, I had to figure out the rest of the material. 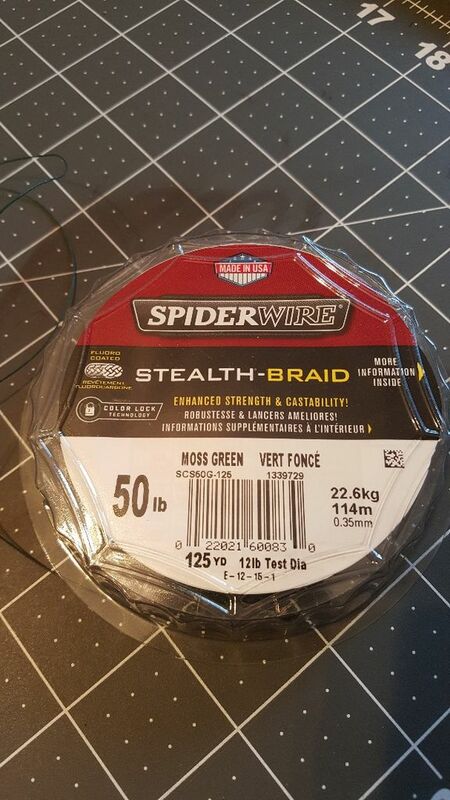 1/4 inch polyethylene tubing – Had this laying around. Same tubing used to run a water line from the sink to our refrigerator. 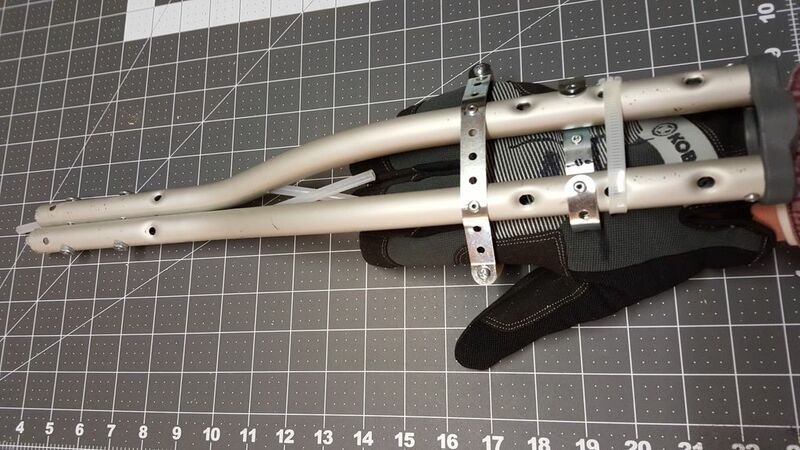 Based on experience with some previous projects, I wanted to use the aluminum tubing from some used crutches due to their light weight and the fact that it’s easy to work with. Most of all, I didn’t just want to have a lifelike skeleton hand sticking out of a robe, I wanted to show the wrist bones and forearm bones to maximize the effect. 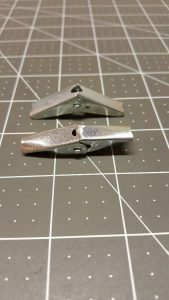 I’m still not convinced that the joints I used from the toggle bolts are the best idea but they do work well for this project. 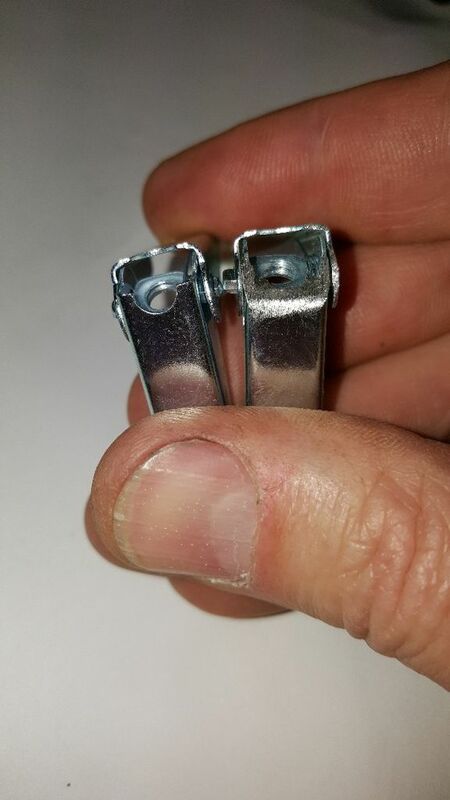 However, the downside is that the springs built into the toggle bolt hinge is rather week. After some trial and error, I did destroy a handful of toggle bolts so I salvaged several of the springs and added them to other joints to increase the spring tension. 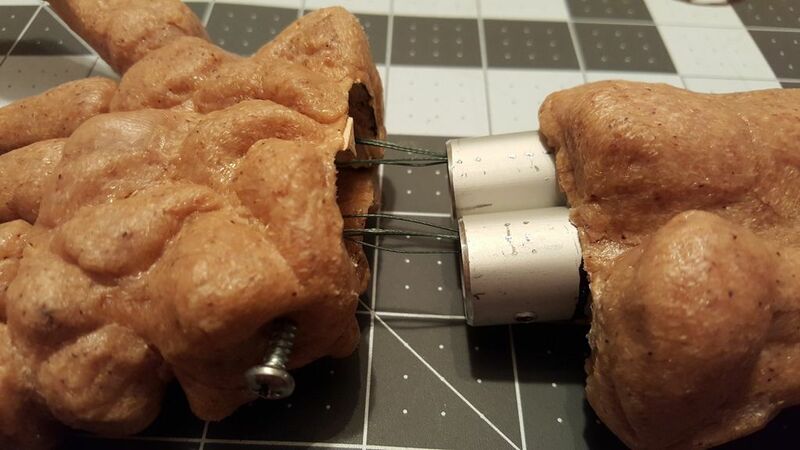 I found that as I added the Worbla, it added weight and the springs were not strong enough to fully open the joints. To solve this problem, I found some old elastic sneaker laces that I was not using. These laces were basically small bungee cords. 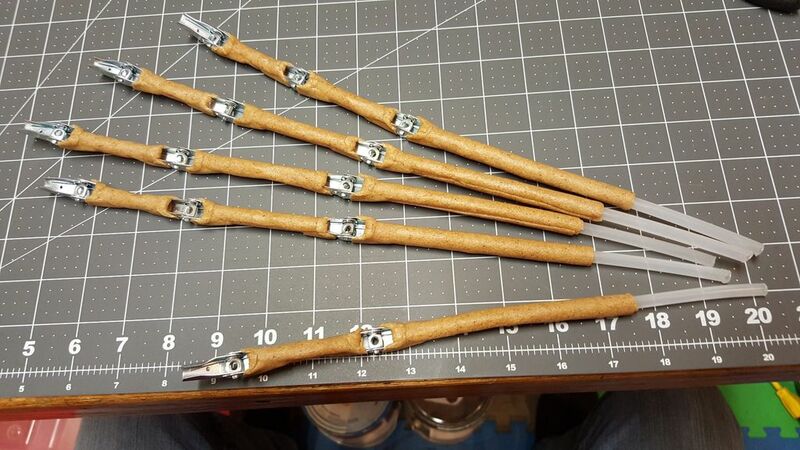 I’ll explain below on how I was able to incorporate these bungee cords into the Worbla to complement the joints and provide additional spring tension on the joints. 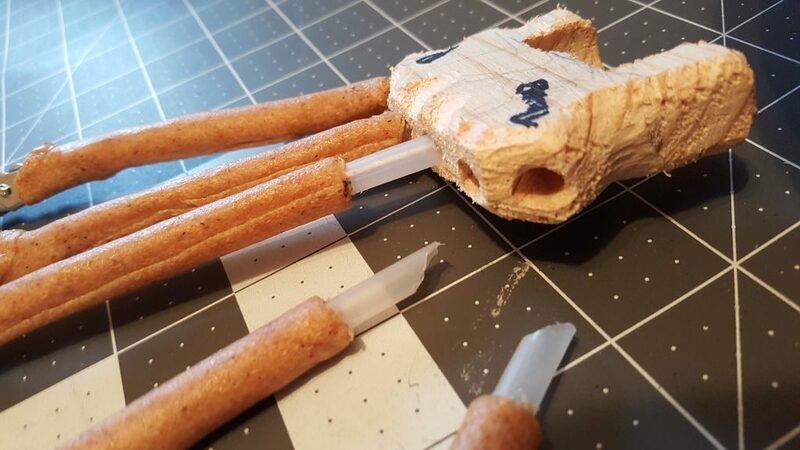 For this project, I’m replacing the lower arms on my Grim Reaper custom so I designed the forearms to connect to the elbow joint. 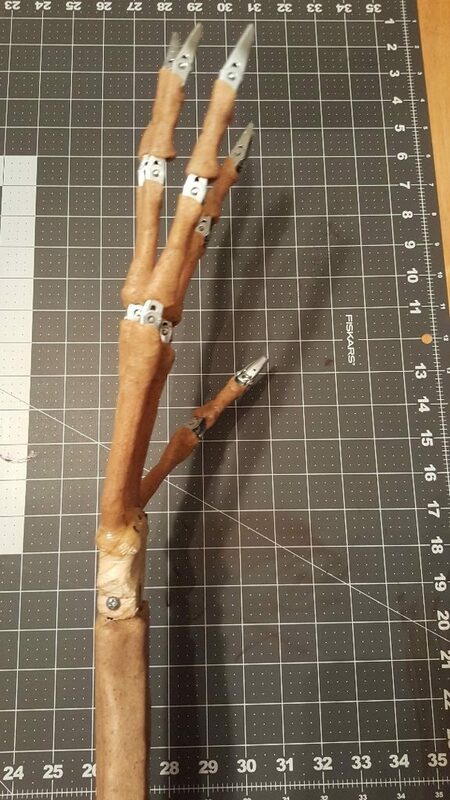 Just below the elbow, I would attach a glove and handle where I can easily grab hold of the lower arm and manipulate the fingers. Since the upper arm is attached to the custom framework that is attached to me via a backpack, I can easily maintain my control of the arm without requiring additional strapping to tie the forearm directly to my arm. Let me explain that a little better. 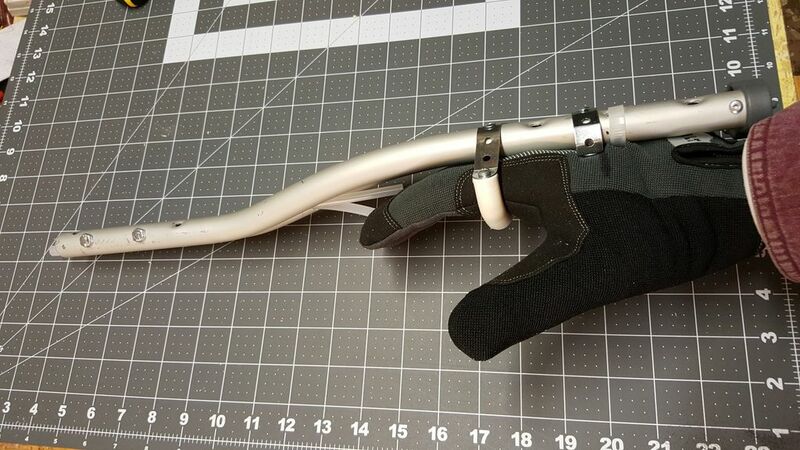 Since your hand needs to be free enough so your fingers can manipulate the articulated hand, it’s difficult to maintain control of the overall arm without strapping the device to your own forearm for stability. In my case, I gain the stability by having the elbow joined to the upper arm which is secured to my body via the backpack. 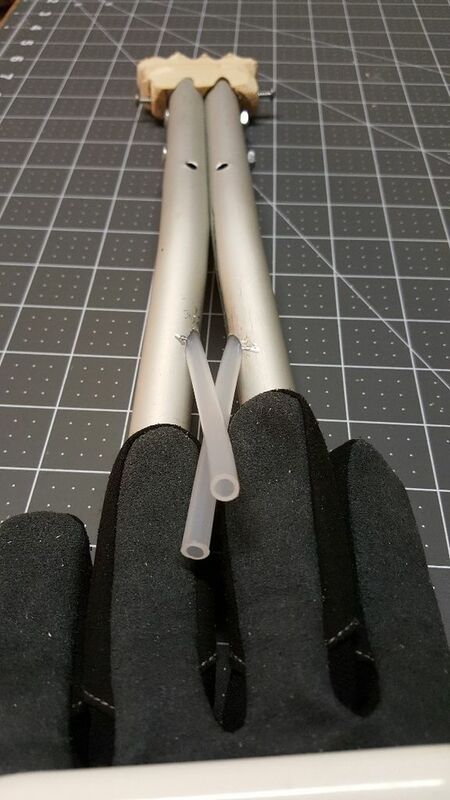 After disassembling the aluminum crutches, I cut them to length taking advantage of the existing bend in the pipe so that two pipes are joined together at the wrist end and the bend in the pipes spread apart toward the elbow end. This provided a relatively narrow wrist bone that I can easily pass the control strings down and a wider area toward the elbow end to attach the glove and handle to manipulate the arm. 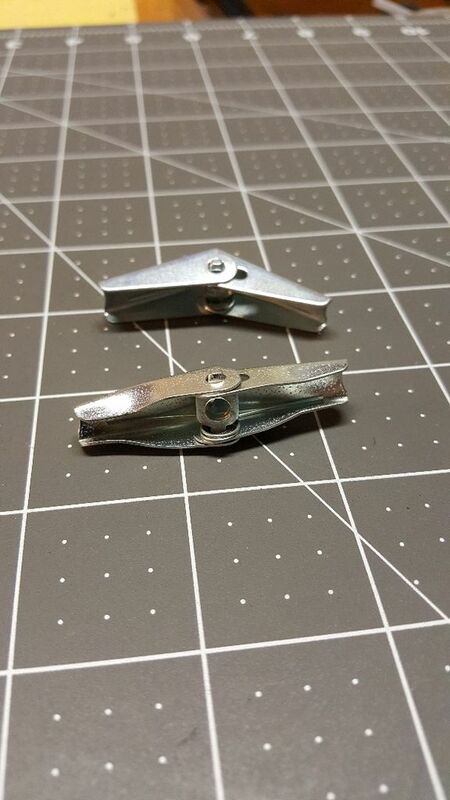 Using some 2-1/4″ bolts, I drilled a couple holes in the pipes to secure them together at the wrist. 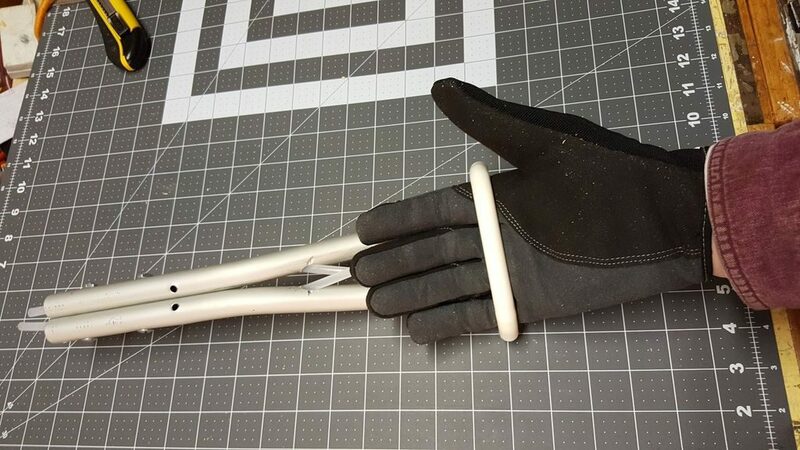 I then used some metal fastener straps to create the area where the glove would attach. I drilled 1/8″ holes and used rivets to secure this together. 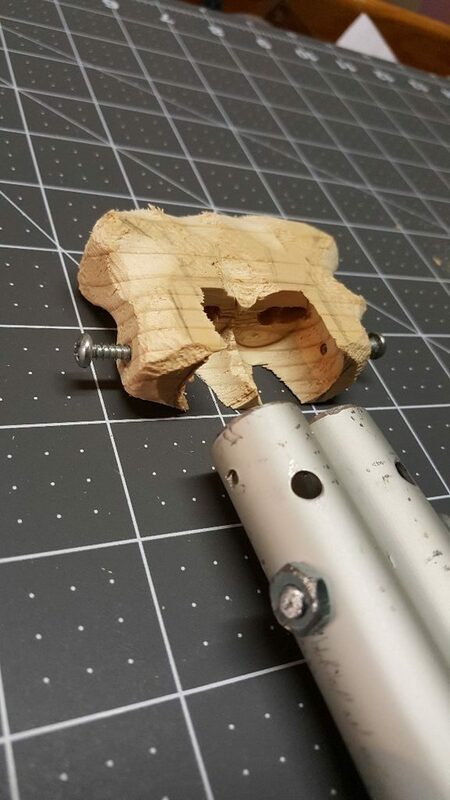 I also leveraged the plastic part of the crutches to create an end piece on the elbow end that will later be used to connect with the upper arm. This was pretty straight forward but time consuming. 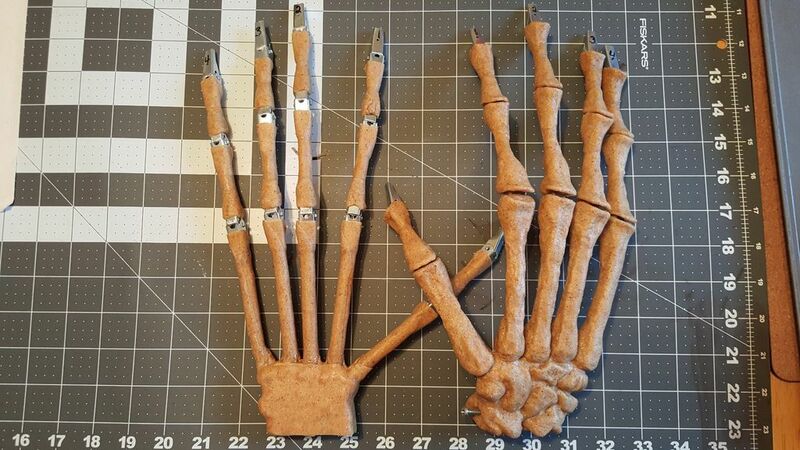 Measure your hand and each joint to get the proportions for each finger as accurate as possible. You can go with life size of in my case, I’m applying these hands to an 8 foot tall reaper so I needed hands about 1.35 times larger than my own. 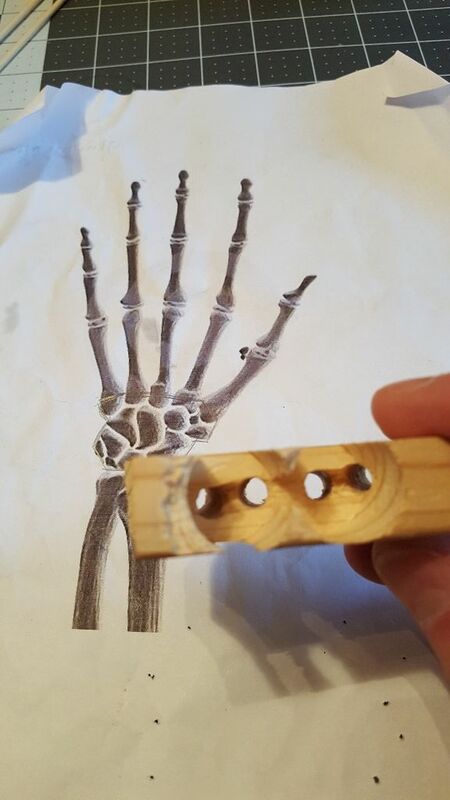 I drew out the measurements on a piece of paper and allowed for longer lengths of tubing that would extend into the wrist. 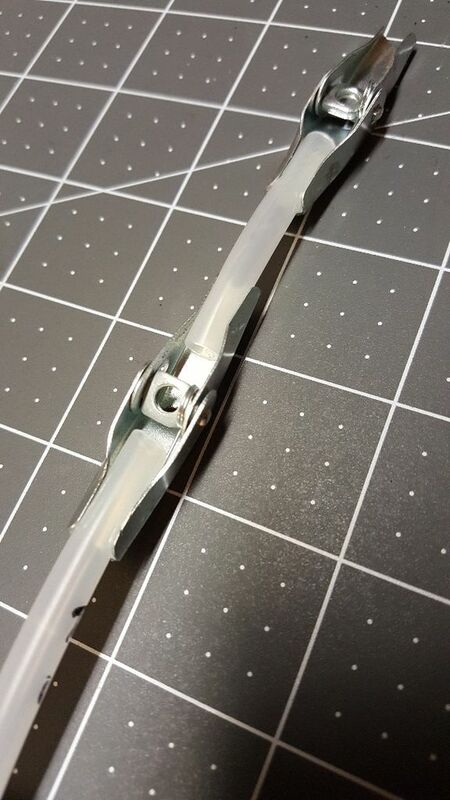 Need to have a little extra here to embed into the wrist when assembling. 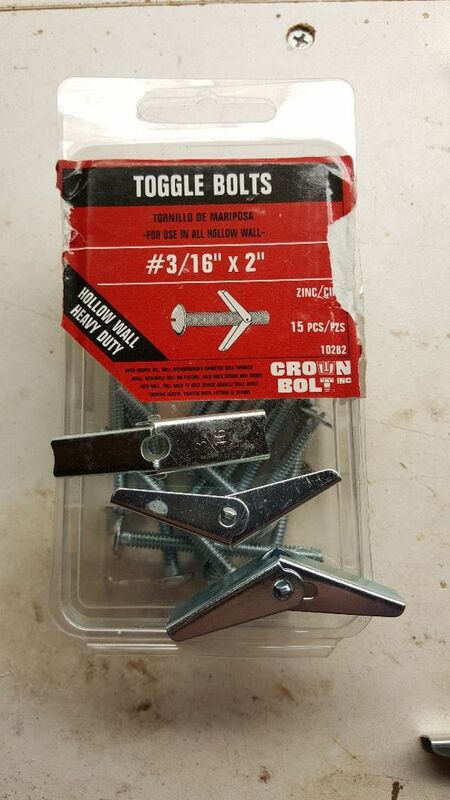 The toggle bolt hinges do not open all the way by design. I needed to modify each hinge to remove some material so the hinge opens to a more straight position. 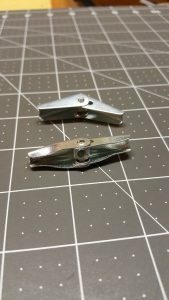 I tried a few different methods like using sheet metal cutters to trim some material off or bend the metal with plyers but the best method turned out to be grinding the material down. 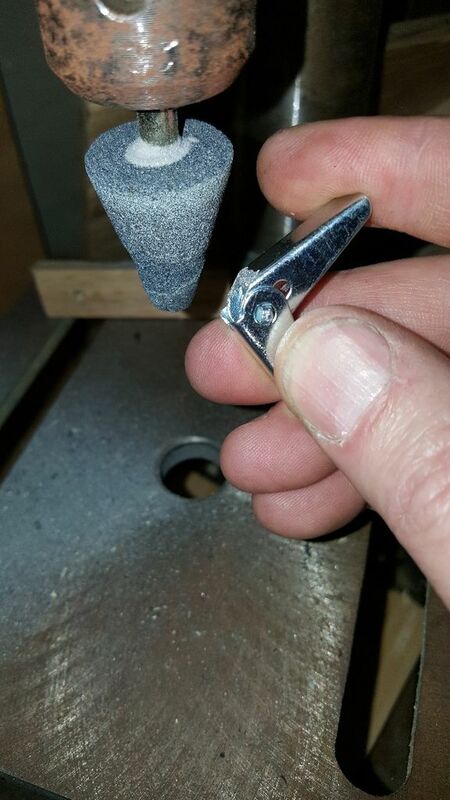 I used a table top drill press with a grinding bit to remove the extra material around the joint. I supposed a desktop grinder or something similar would also do the trick. It takes a couple minutes per joint but wear gloves and eye protection. 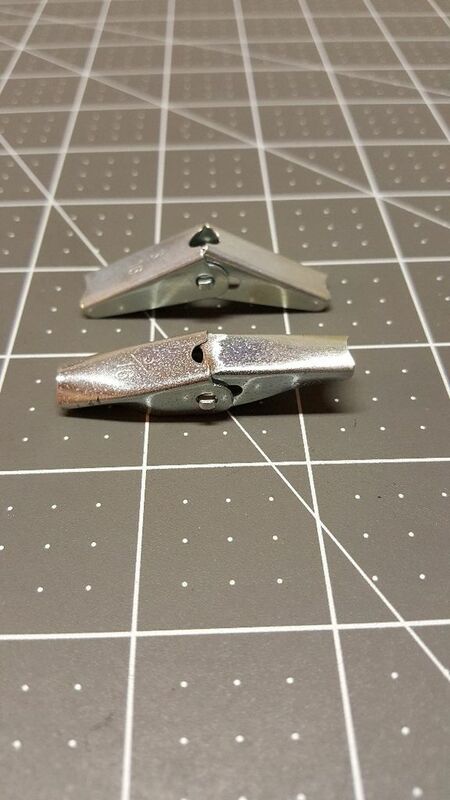 Little bits of metal are getting thrown off the grinder and the hinge heats up very quickly. Speaking of the heat, grind off a little at a time, don’t rush. I realize on the first few that I did, the spring heated up too and lost some of its tension making the joint too weak to be used. Connecting the 1/4 inch tubing to the hinges was very simple. I started with regular plyers to crimp the metal ends of the hinge around the tube which worked fine but when I spotted my little nail remover plyers that had a very nice semi-round shape on the end of the tool, I found that to work the best to roll the metal ends over the soft plastic tube. This method makes it very easy to adjust the distance between each joint. 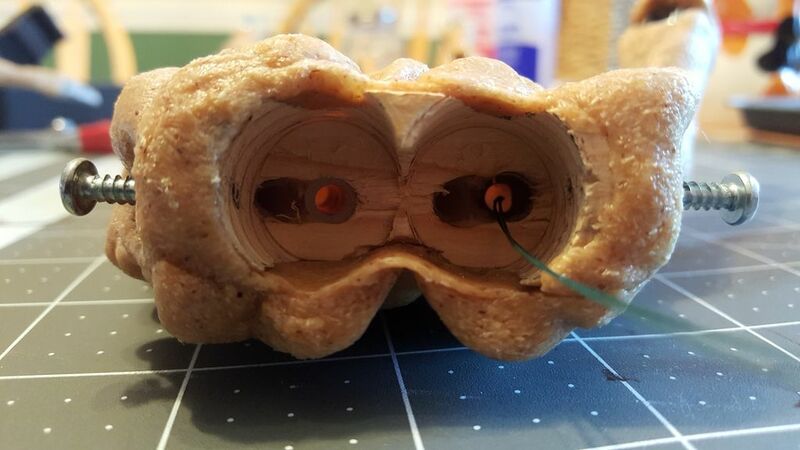 Simply slid the tube in and out of each joint to adjust. It just needs to be a snug fit. Later, the Worbla will cover everything, holding it all together. You can probably approach this from a few different directions and materials. 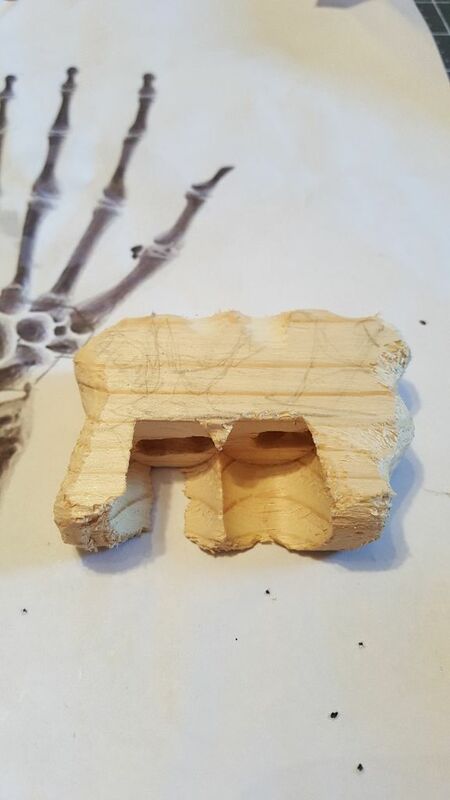 I chose to cut a piece of 3/4 inch thick pine board that was laying around into a rough shape the wrist. 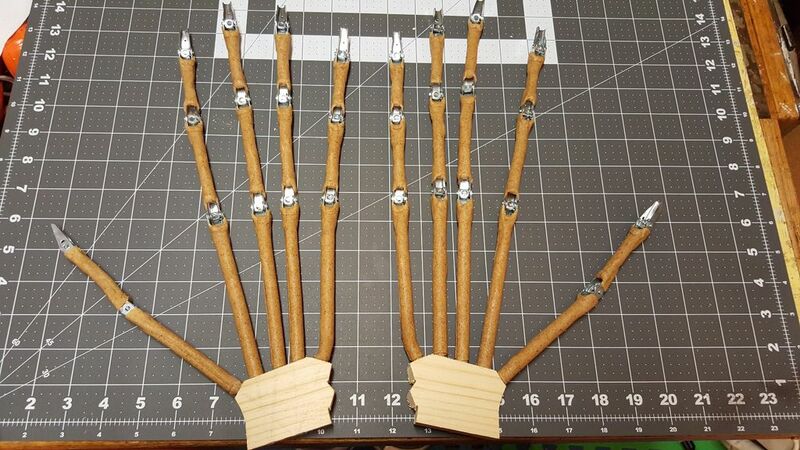 I laid out lines on the wood to determine where each finger and thumb would enter the wood. This is why you needed some extra tubing noted above. 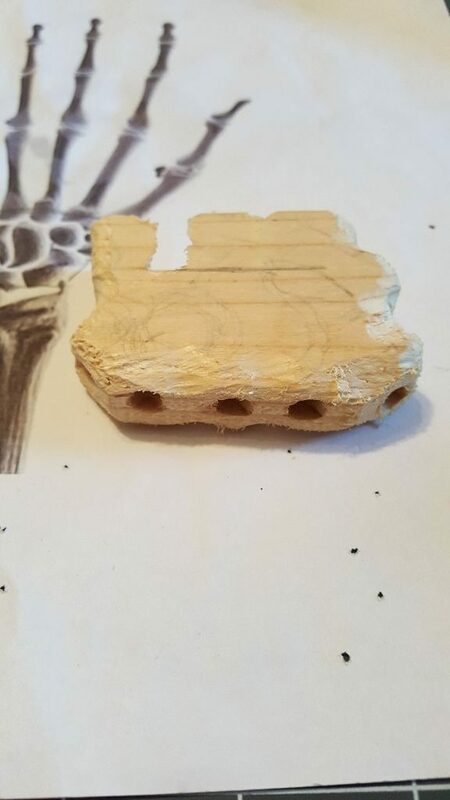 I used a 1/4 inch drill bit to drill the holes. 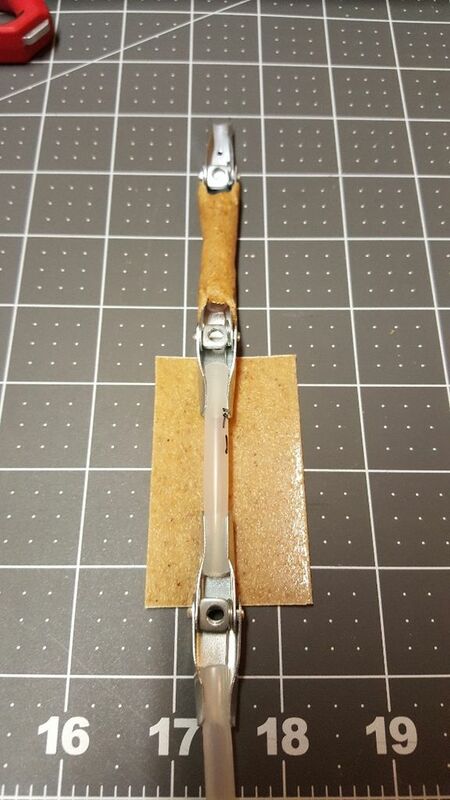 Once I had the finger holes drilled, I needed to attach this piece of wood to the end of the forearm assembly. 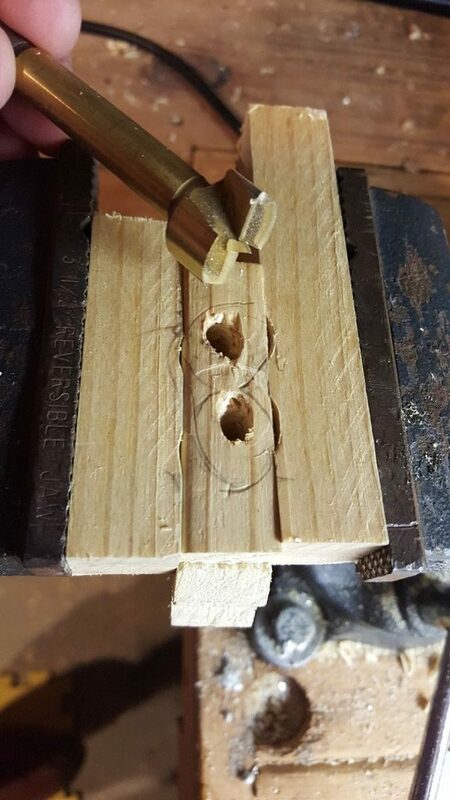 This was accomplished by placing two sacrificial pieces of wood on each side of the wrist and clamping in a vise. 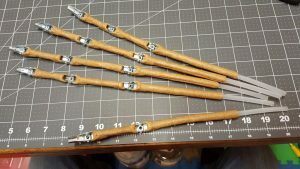 I then marked the location and diameter of the aluminum pipes from the forearm onto the wood and removed the material using a Forsner bit to a depth of about 1 inch. 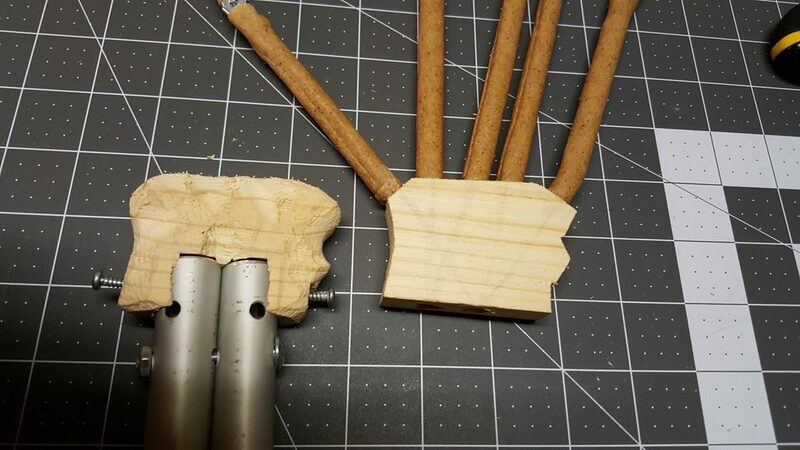 Leaving enough wood on either side to drill two small screw holes to secure the wrist onto the forearm pipes. 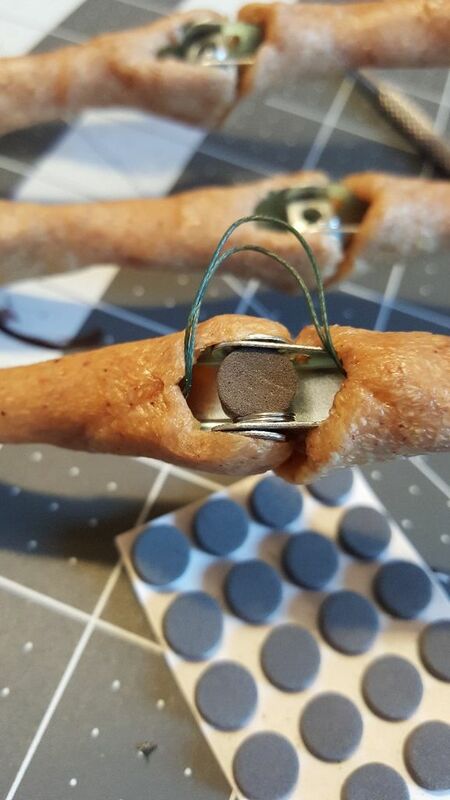 The aim is to have each finger tube come together inside the wrist so the strings would all flow together up the forearm. 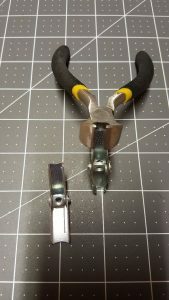 Now you can cut off the excess tubing so that each finger fits nicely into the holes and they don’t interfere with each other or the path for your control strings. With the drilling and dry fitting completed, I mixed up some two part epoxy with a 5 minute set time to secure the 1/4″ tubes into the wood. 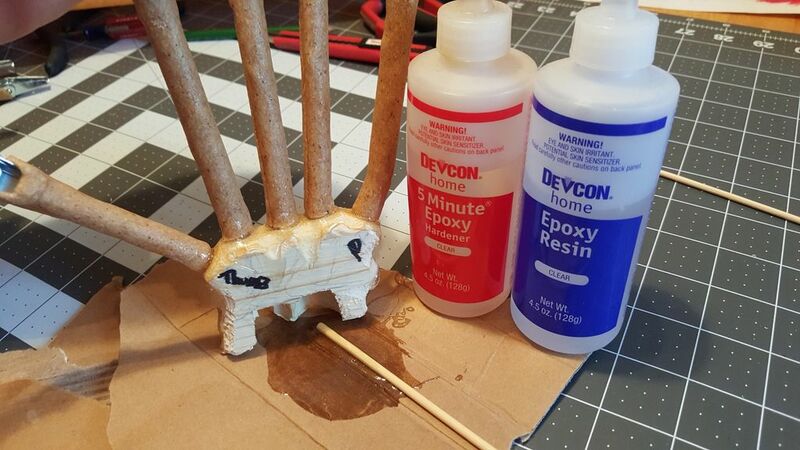 If you are doing two hands (left & right) carefully stage everything you need and working quickly with the epoxy on each hand separately. Trying to do them both at the same time will only lead to problems and once the epoxy cures, your done. Any mistakes here and your starting over. After the epoxy cures, leave the assembly over night so it gets good and hard before continuing. 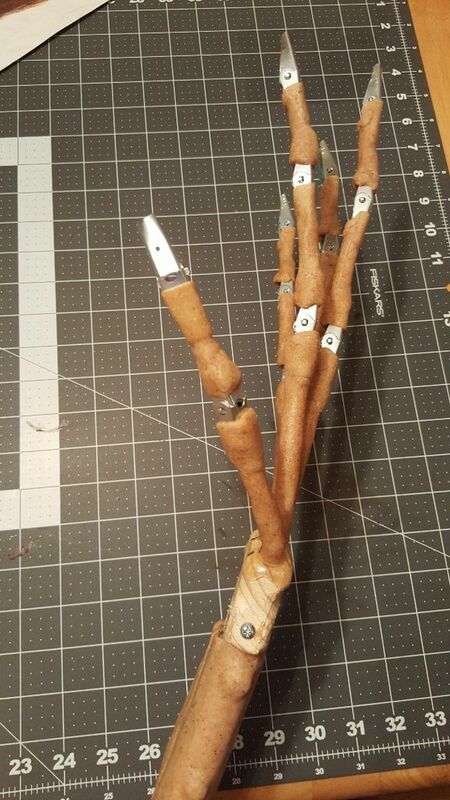 With all the basic components of the arm and hand completed, I was ready to start applying Worbla. This was my first time using this stuff and I have to say, “I Love it”! It takes a little time to get it just right but after watching several YouTube videos, I was able to master this stuff pretty quickly. You’ll want to cut the Worbla into several small pieces sized to the area you are working with. 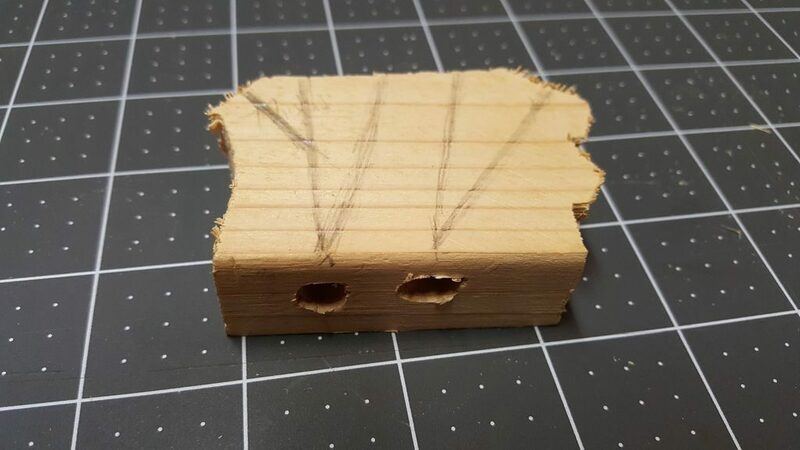 This does not have to be 100% accurate because Worbla is very forgiving and it’s pretty easy to add a little more or remove a little if you’ve applied too much. I use an old cookie sheet for a lot of projects where I need to collect several small parts or pieces and the non-stick coating on the cookie sheet turned out to be the perfect bed to heat up the Worbla without it sticking to the surface. 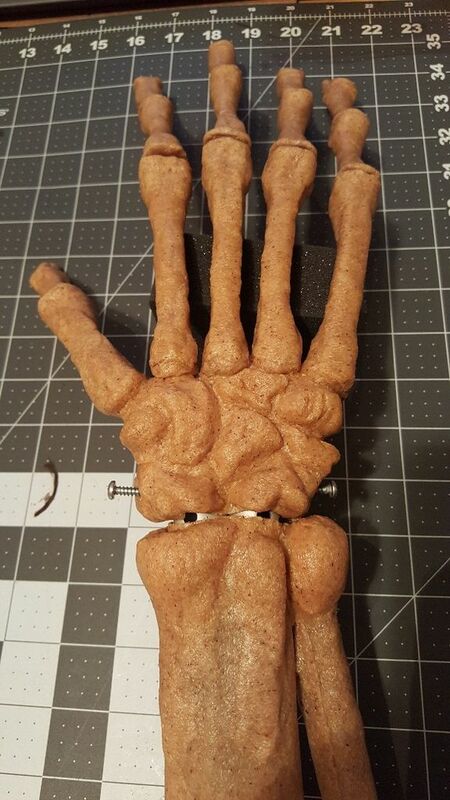 I used my heat gun to heat it up and get it to a soft consistency then simply picked it up and transferred it quickly to the hand and formed it with my fingers. It needs to be hot for this to work but not so hot that you cannot touch it. I did find that after a few hours of working with Worbla, my fingertips were very sore but that was mostly due to the constant pressing and shaping as it was cooling. 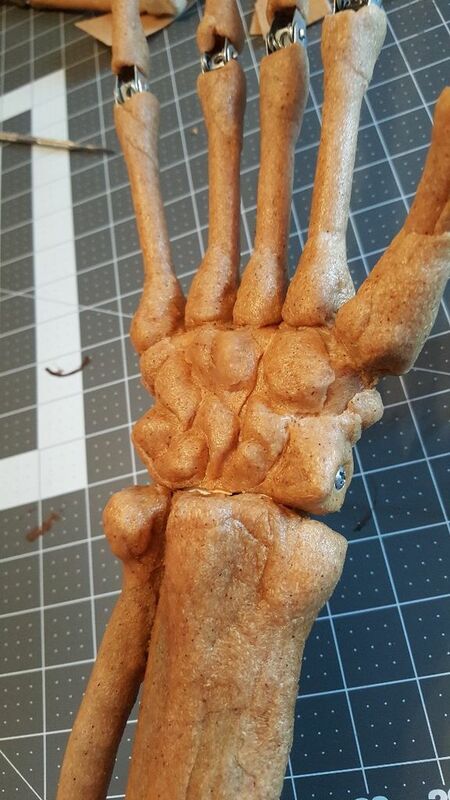 At times, I had to reheat the Worbla on the hand itself to adjust and shape it. 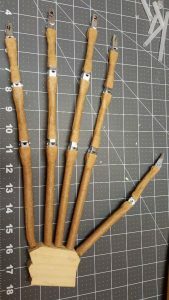 I also found that using metal carving tools or dental tools, you could adjust and detail the Worbla at a very fine level. 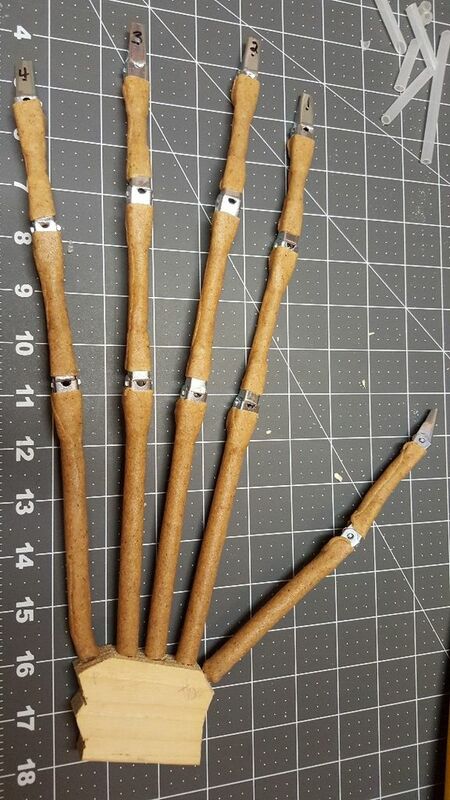 These tools were very helpful when trying to adjust the Worbla around the knuckles and joints. 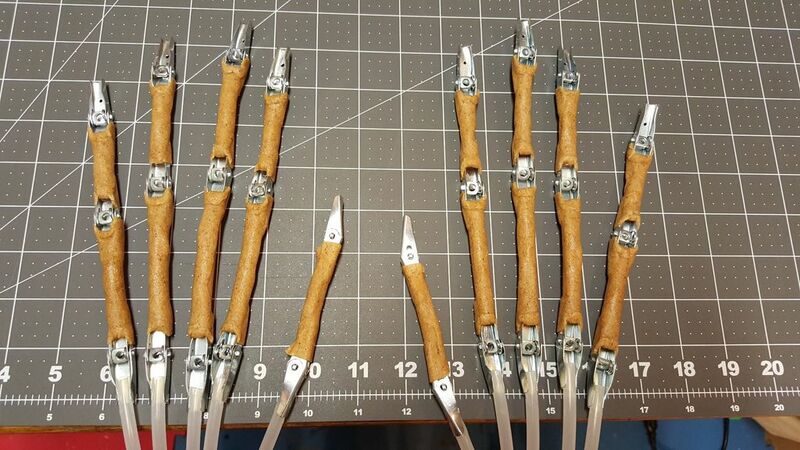 The first application was around the fingers before epoxying them to the wrist. This way I was able to adjust them to the proper lengths and line them up for each hand. 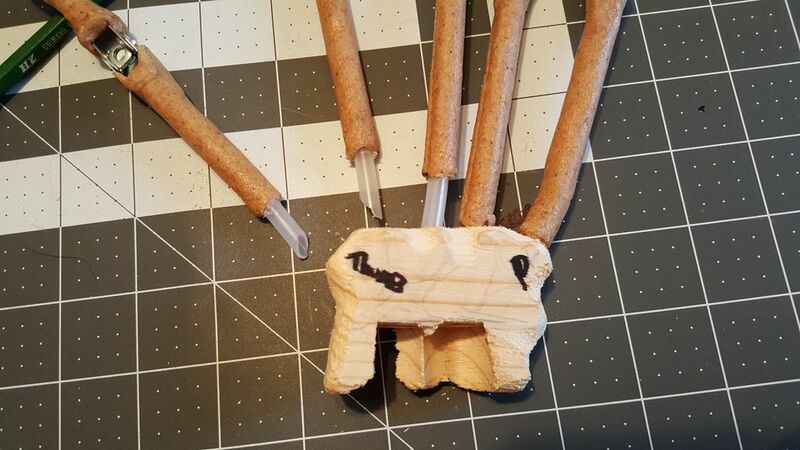 The Worbla was also very useful to bend the tubing to the shape and direction I wanted. 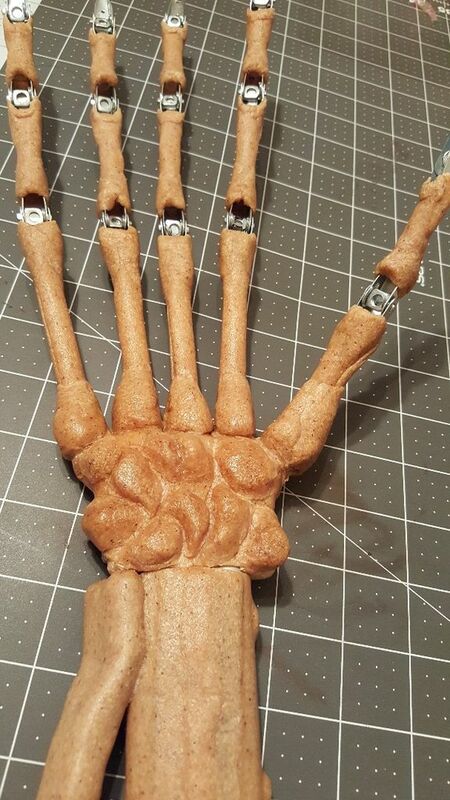 Once Worbla cools down, it keeps whatever shape you gave it allowing for very fine adjustments to the positioning of each finger. 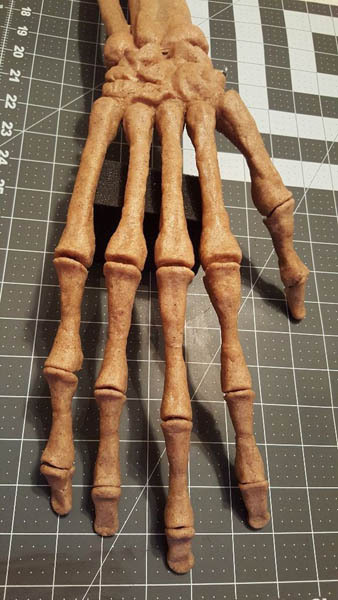 I used several reference images of skeleton hands to shape the wrist and fingers. 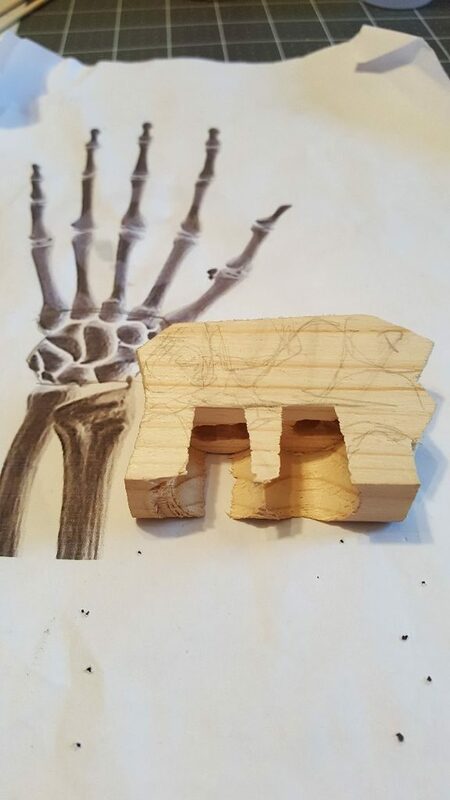 It’s definitely not anatomically perfect but looks very accurate. 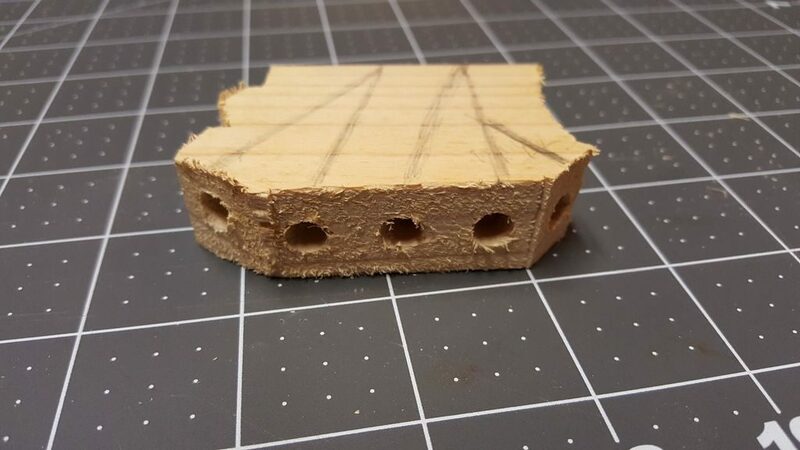 Since Worbla is naturally sticky, I used a larger piece to wrap the wrist wood piece to create a nice base for the rest of the Worbla to stick to. 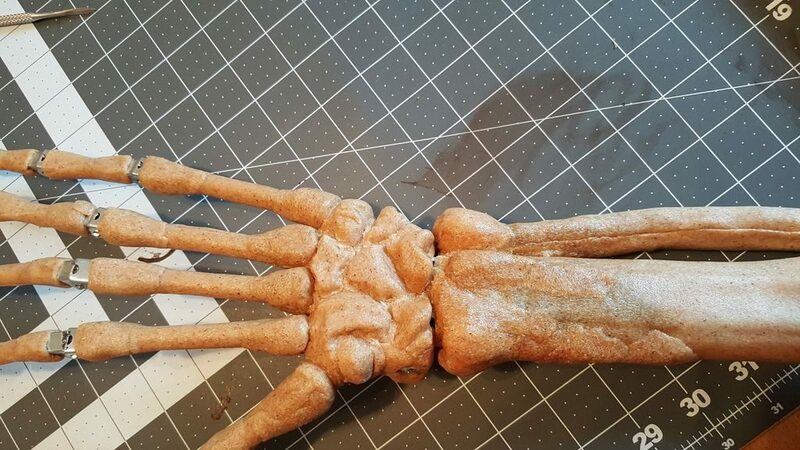 Creating the bone look was done by heating up small pieces and rolling into balls or oblong shapes and then pressing them into position on the wrist while blending in the finger bones. I also used a large piece of Worbla to wrap the aluminum pipe or the forearm. I filled in the gap between the two pipes with a piece of rope so the two pipes would look like one large bone. 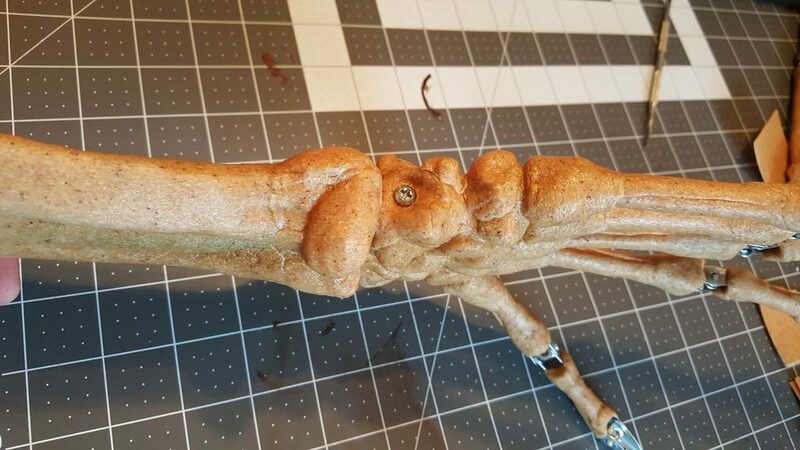 I added more Worbla at the wrist end of this bone to shape it like a bone and then wrapped a length of rope with Worbla which I just stuck onto the side of the aluminum pipes to make it look like two separate bones for the forearm. I then attached the wrist to the forearm and added more Worbla pieces to finish it off but I still kept both part separate so I can later disassemble if necessary. The fingers took the most time. 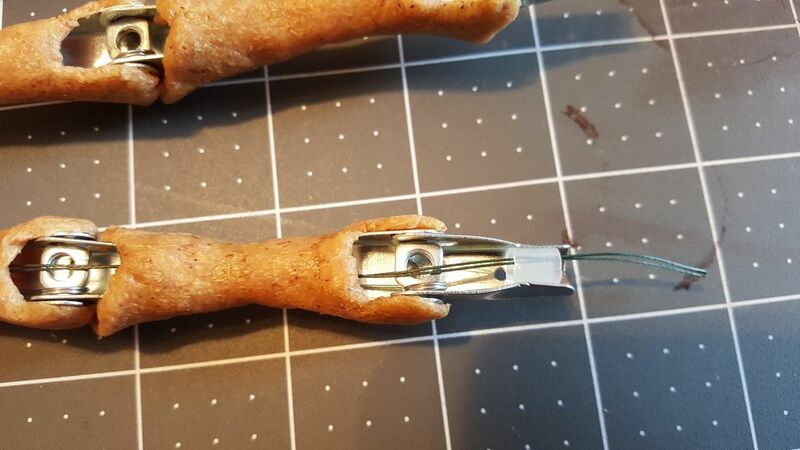 Each one needs to be shaped to look like a boney finger and since this will be right in the face of my victims, it needed to look as good as I could make it. 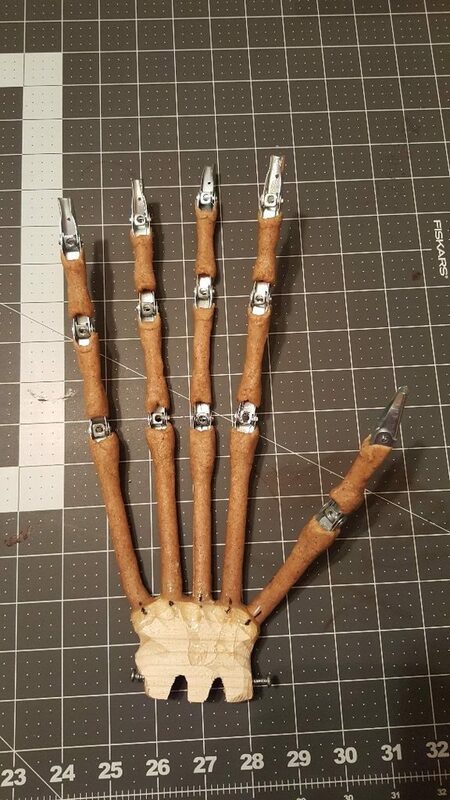 One hand took over 16 hours of work applying and shaping the Worbla. 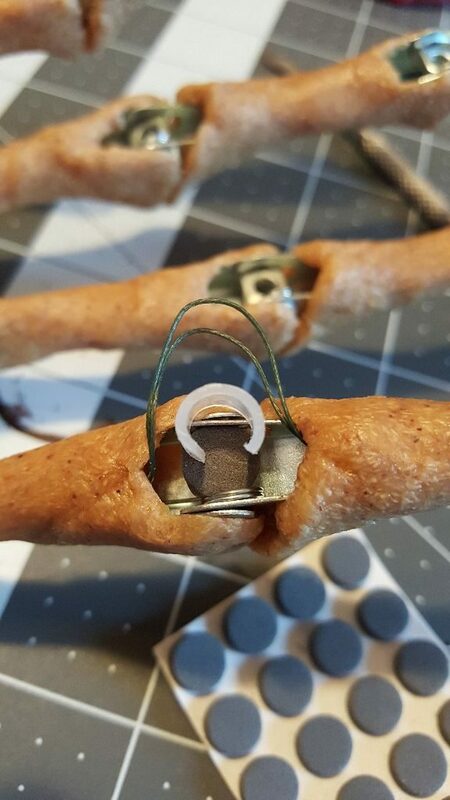 As mentioned above, some of the springs in the joints were not strong enough to spring back each finger once the Worbla was applied due to the additional weight. 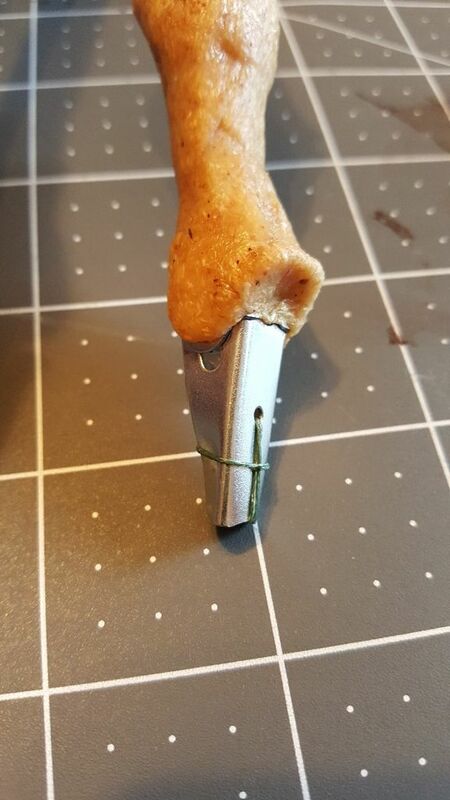 The solution was to split the knuckle down the length of the finger and insert a piece of bungee and then fold over the Worbla to secure it in place while the finger was straight. 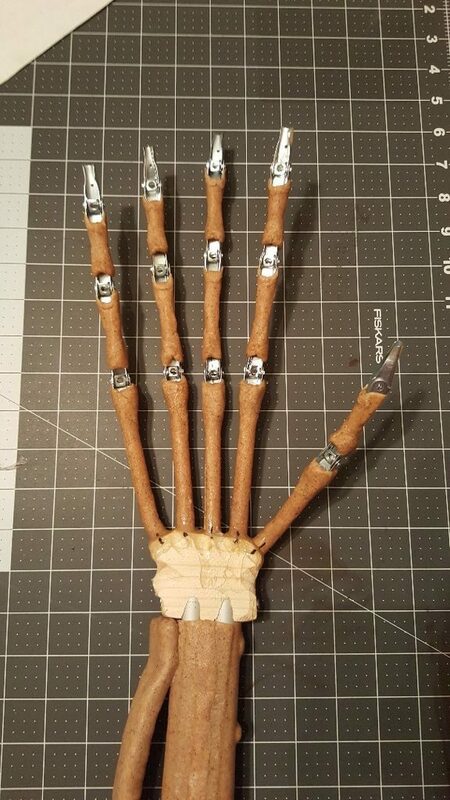 This required heating the Worbla on each finger which was tricky because you have to make sure the Joint remains clear and you don’t stick each finger section together. 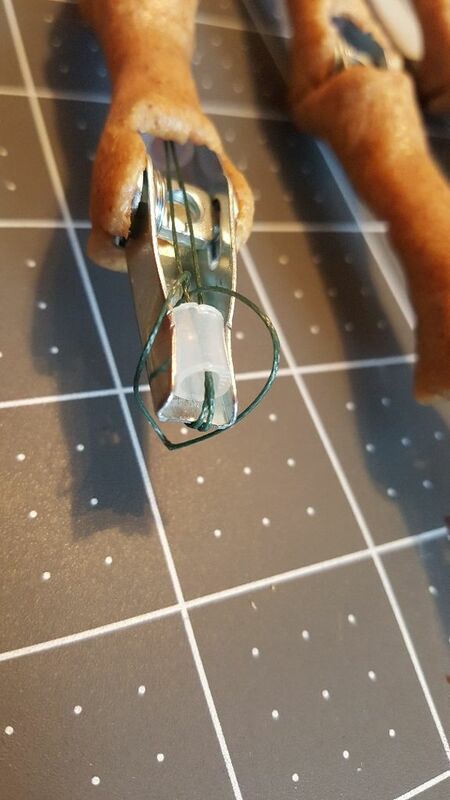 I found that I could place a small piece of wax paper between the joints to prevent the Worbla from sticking while embedding the bungee. 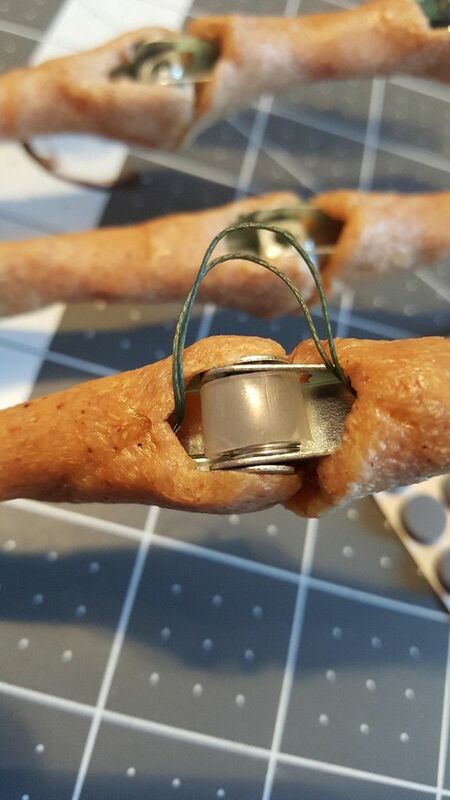 Once the Worbla dried, the additional bungee provided the perfect amount of spring back that I was looking for. 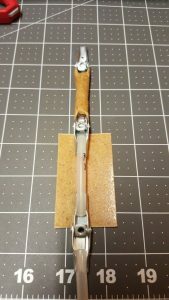 Only needed to apply the bungee to a few joints, most did not require it. 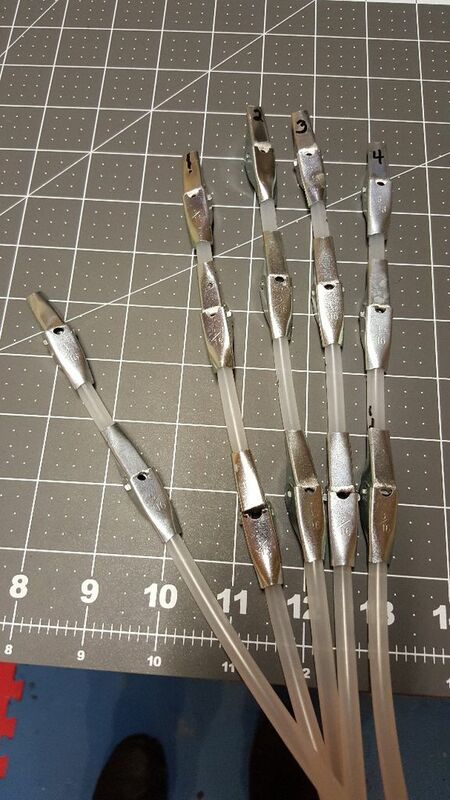 I threaded each finger individually with long lengths of high strength braided fishing line. By folding the fishing line, I was able to easily feed it up through each tube from the wrist up to the finger tips. 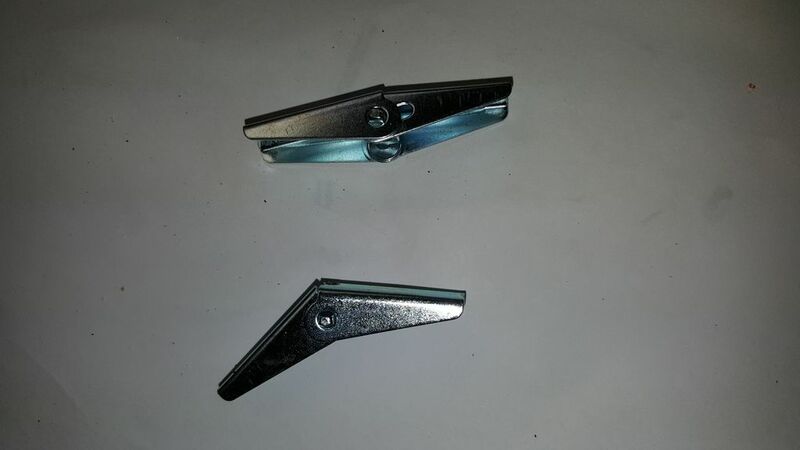 The images show how I secured each line to the finger tip. After feeding the string, I found that I needed a lot of pull tension to get the fingers to bend. 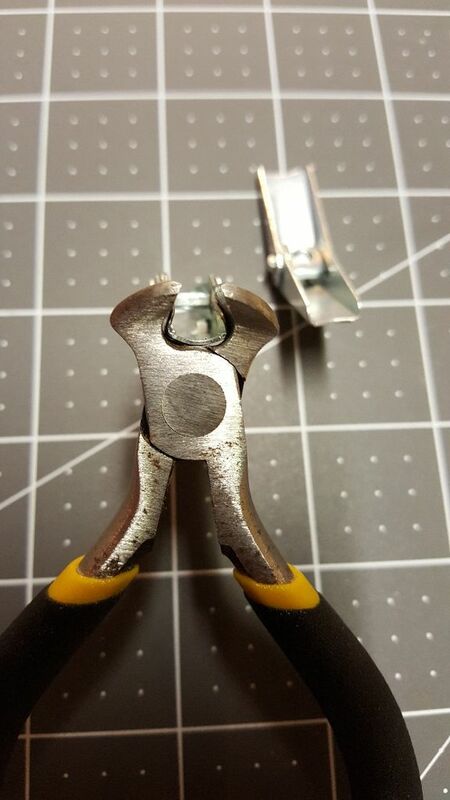 The string needed to be pushed out a little at each joint away from the center line of the hinge. 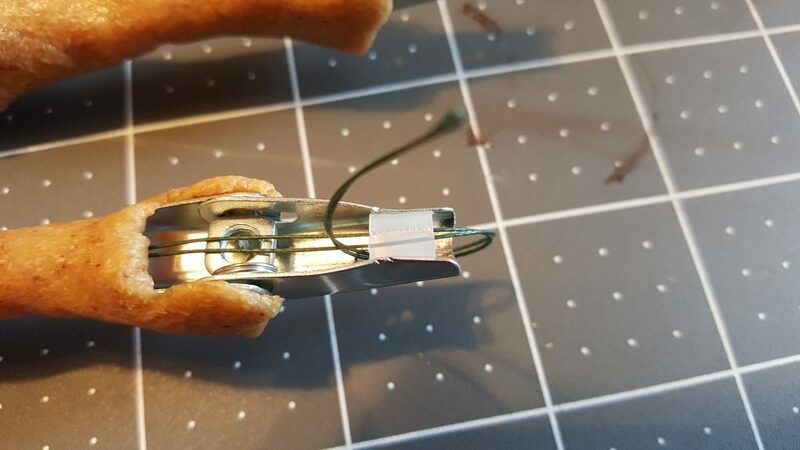 To do this, I tried several bits and pieces of stuff I had in the shop but come up with some sticky pads covered with a short piece of tubing cut in half to create a cover of sorts over the joint allowing the string to pass over without restriction. The string holds the tubing in place and stays perfectly centered. This made a huge difference reducing the amount of pull tension needed to bend each finger. 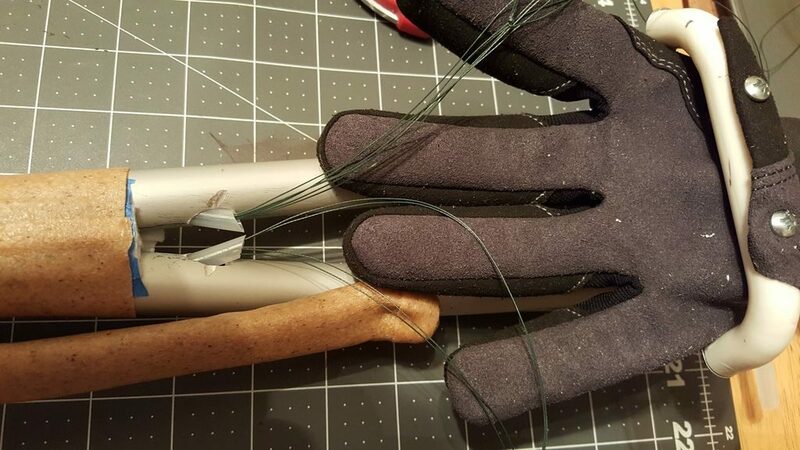 Once I had each finger threaded, I ran the strings through the forearm tubes out to the glove and use a needle to thread the line into the finger tips of the glove. Since I could not manipulate the thumb with my thumb, I tied the thumb line to my third finger. Surprisingly, with a little practice, you can get a very natural movement of the thumb as you close your fist with the third finger controlling it. 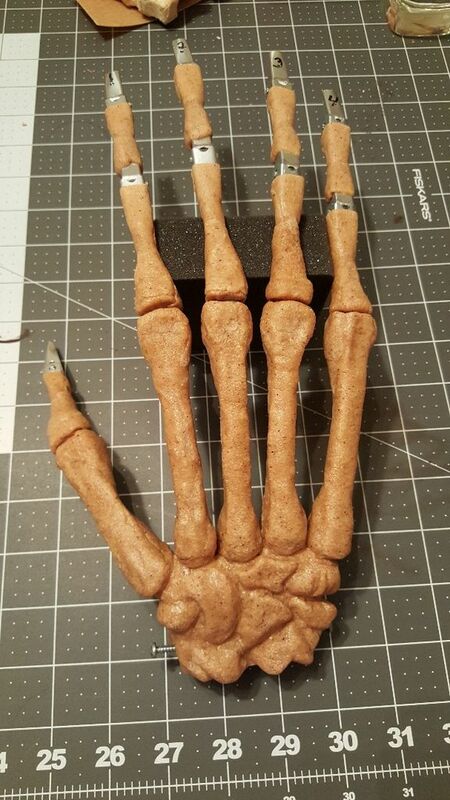 Satisfied with the assembly, I finally covered the finger tip bones with Worbla to finish of the construction. 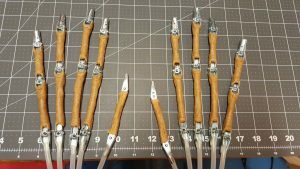 I have some more work to do on some of the joints to make subtle adjustments to the open and closed position of each joint. 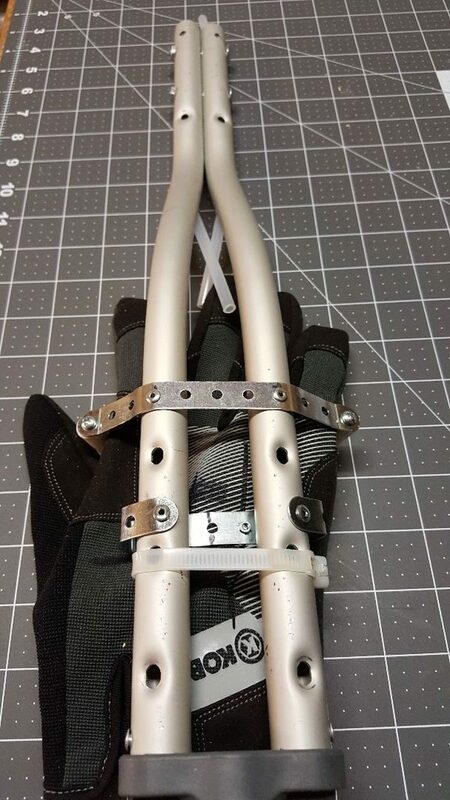 I’m also working on the left hand and plan on attaching the bungee on the knuckles earlier in the project to simplify the construction and create a matching left hand. I will be attaching a very light weight black cloth material to the inside of each knuckle to cover inner workings of each joint. 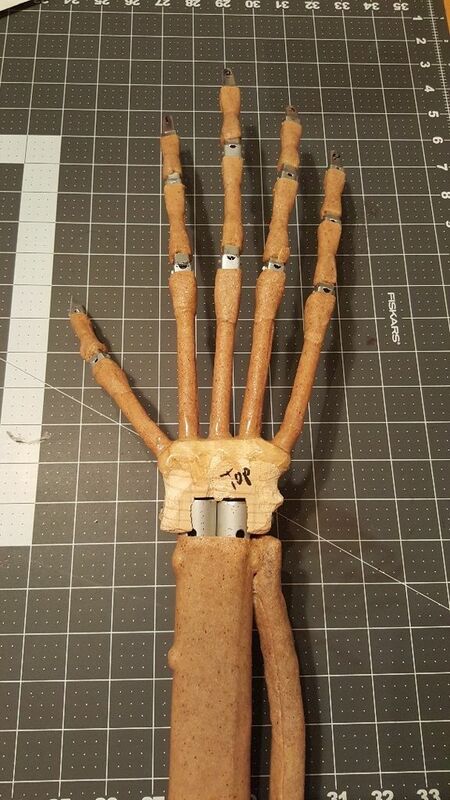 This should create an interesting look to the inside of the hand but hide the mechanical aspects of the exposed joints. With a little airbrushing on that material, it should look pretty good. 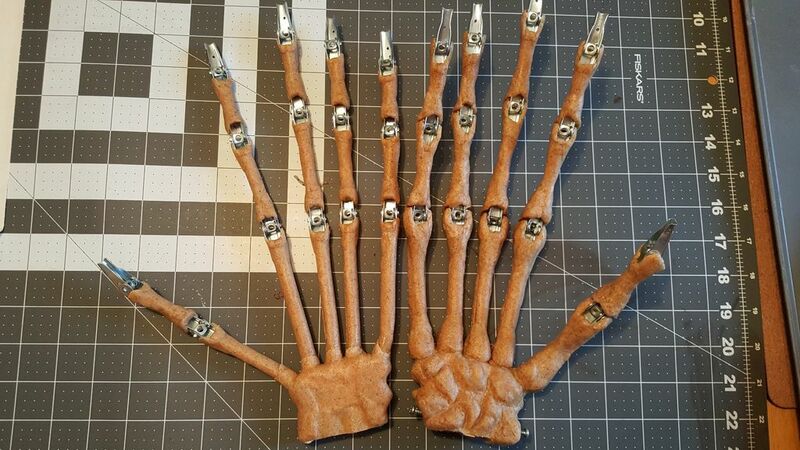 Finally, I’ll need to paint and airbrush the bones to match the rest of the reaper costume to complete the project. I want to thank all the other authors who built articulated hands and shared them online. I probably viewed them all to get ideas for this project. 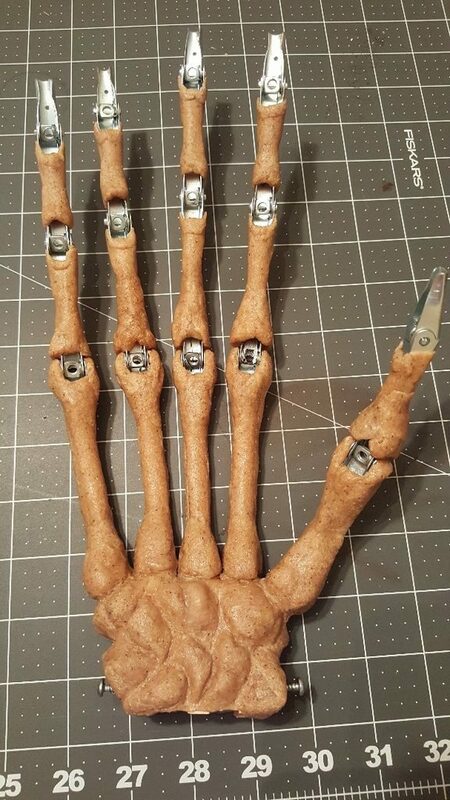 Thanks for the insight you all gave me to finally make an articulated skeleton hand that will take a lot of abuse and last a long time. Thanks again to Gary Petit for sharing this with us!